The car data just keeps pouring in. Numerous vehicle sensors have been hitting the road for years and are generating tons of owner and vehicle data. It is estimated that over eight million cars now have OEM-embedded telematics globally. The sensors/data generators range from deep within the engine to vehicle control to cabin comfort and entertainment to vehicle proximity to satellite tracking. The latest in a constantly growing list of car data types is in-car package delivery from companies like Amazon. What are OEMs doing with all this car data? Well, they want to monetize it, just like Google and Facebook monetize the data they collect from their users. OEMs want to: (1) use the data to create new car features for upcharges, or (2) sell the data to industry partners to use in their businesses. There are two recurring problems for OEMs that relate to car data monetization. One is product-centricity, and the other is being too slow. Automakers have struggled with quickly creating new data-enabled products that succeed. While new product innovation is always risky, it is best to embrace approaches that are customer-centric and accelerate the product innovation cycle. Monetizing car data can only be a profitable venture if consumers are convinced of the benefit of its various use cases. On the one hand, this statement seems entirely logical. But it is more problematic than it first appears. Yes, car data monetization must benefit consumers. The use cases much show that, when we share our personal car and usage information, we receive products and services that improve our lives, save us money, make things easier and introduce us to new products or services that are relevant to us. On the other hand, the auto industry has struggled infamously for two decades with monetizing car data and the connected car. In many ways the highlighted statement above reflects an old, recurring mistake: car data is a product searching for a market. How can we monetize car data? What car jobs do people want done? The first question leads the product innovation process to start with a use case and to assume that some group of consumers somewhere has needs that fit the use case. Then the task is to define how large those markets are and what their profitability might be. This is the essence of product-centricity. It starts with the product and works backward to the customer. When a company instead focuses on car jobs to be done, it starts with the customer and their world. It explores which car-related jobs are important to the customer, and whether any of them are underserved. Then, and only then, does the customer-centric discipline venture into the exploration of whether car data can play a role. This is the essence of customer-centricity. Customer-centricity is like driving forward: you start with Jobs-to-be-Done (JTBD), find those that frustrate customers and are not well served, and then explore how the assets at your disposal, such as car data, can be used to better deliver on those important unmet needs. Much of the car data monetization struggle can be traced to an insufficient understanding of the jobs to be done. The analysis should start with the jobs, not the car data. It is a proven way to debias your company as it moves through the product innovation process. Research shows job-based and outcome-focused innovation processes yield an 86% success rate. Notice that not one of the top five features has an explicit tie to car data or connectivity. The product-centric approach of starting with use cases totally misses the point that car data monetization is an uphill battle. But, the customer-centric approach explicitly looks for important unmet needs, and only then does it ask if car data or connectivity can solve the unmet need. It is also important to note that fuel efficiency and reliability imply that cost of ownership is a major concern for consumers. New car data features that require incremental subscription payments and increase cost of ownership could be problematic. Indeed, car researcher Edmunds noted back in 2009 that car buyers consistently resist paying subscription prices for connected car and car data-related features. One of the major risks of the customer-centric approach of focusing on car jobs to be done is speed. It is tempting to “boil the ocean” in the hunt for important unmet needs. Car jobs represent a vast universe. One major benefit of the use case starting point is that it narrows the scope of the investigation. While simple is better than complex, success is better than failure. The trick is to narrow the scope of the JTBD investigation in a way that accelerates yet does not oversimplify. Car data offers a wealth of information about car buyers and what is important to them. The opportunity for OEMs is to use it to identify car buyer segments that seem especially attracted to the benefits that car data and connectivity have to offer. The technology behind marshalling big data and using it to drive personalized marketing activity is generally referred to as customer relationship management or CRM. Three phases of evolution have occurred over the last two or more decades in the automotive industry. The first phase (CRM 1.0) focused on new model launches, and this phase is still a primary emphasis in the automotive industry. The second phase (CRM 2.0) builds on 1.0 and adds functionality to digitally influence prospective buyers before they ever visit the dealer. The third phase, CRM 3.0, is all adds personalization: understanding each individual and what they are trying to do, in the moment, as they move through the buyer’s journey. In general, OEMs are in transition from CRM 1.0 to 2.0. The struggle is creating a “single view” of the customer. This is very difficult to achieve given highly diverse data from company and dealer records, let alone data from IoT car sensors, social media and third-party data providers. The most advanced CRM 3.0 systems are now able to greatly expedite the data integration process used in CRM 2.0. The implication for car makers is that they can jump to CRM 3.0, tap the full extent of their car data, start personalizing their marketing efforts, and greatly improve the car buyer’s retail experience. Quickly getting breakfast, and safely switching among news and media stations and selecting stored playlists. Quickly and safely finding alternative routes around traffic congestion. Safely perform various business tasks such as check and respond to emails and texts, add to their to-do lists, and so on. CRM 3.0 systems can also help quantify the size of these markets and the relative importance of these frustrations compared to other factors such as fuel efficiency, etc. With intelligence like this, it is possible to conduct JTBD investigations within high-potential market segments. The automotive industry is under intense pressure. Industry sales are dropping, competitive disruptors are moving quickly, and OEMs are starting to think of themselves as mobility providers, not just vehicle manufacturers. 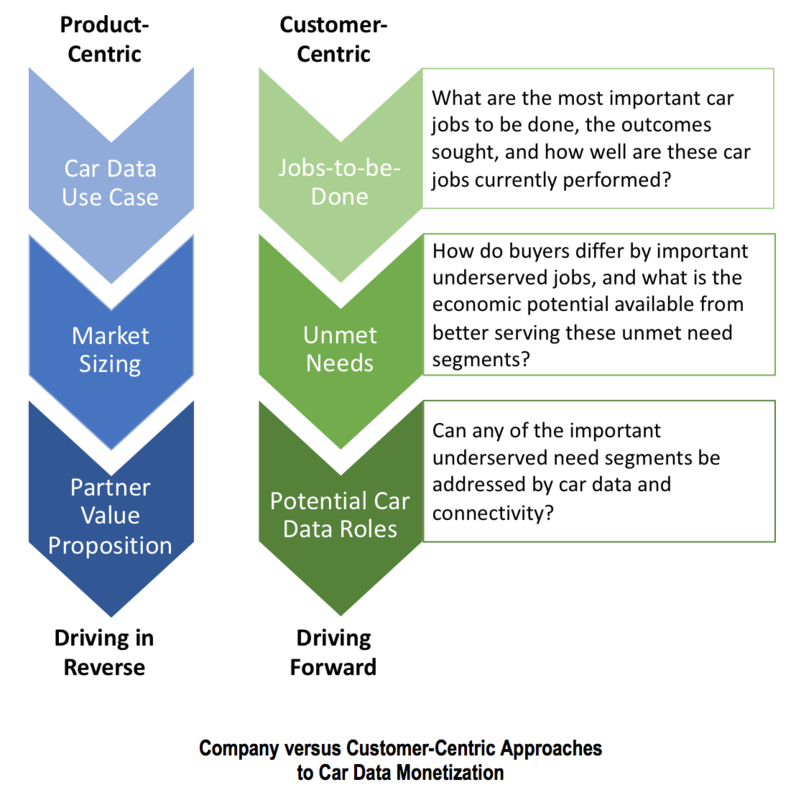 As OEMs seek new revenue sources with car data, they need to avoid the lure of use cases and instead embrace a JTBD methodology that is customer-centric. CRM 3.0 can greatly expedite the JTBD research. Rather than explore all jobs associated with the car ownership experience, OEMs can focus their JTBD research on larger customer segments with significant levels of unmet needs. Daniel Rubin is Head of Analytics—Consumer Brands at Harte Hanks. Jennifer Miles-Losapio is Director of Innovation and Growth at Harte Hanks.